The Environment theme covers a wide range of various topics. 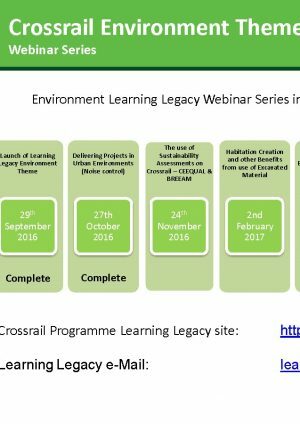 It is an important area and therefore, in conjunction with our partners (IEMA and CIRIA), a series of webinars was developed in order to disseminate the learning specifically around the various Environmental aspects impacted by the Crossrail project. In total there are ten webinars in the series, all of which are now available to view below. They cover topics ranging from the beneficial use of excavated material through to noise in construction as well as the initiatives used to collaborate with contractors to improve performance and provide environmental assurance for the project. An overview of how we dealt with the archaeology of the site is also included using one site as an example.